Can't tell from the pic but if the piston is pushed in ****-eyed it quite likely has damaged the caliper bore. If you need do one side it would be best to do the axle, IMO. Are you sure it is the piston making it appear cocked and not the parking brake pintle? Might not be anything wrong at all. DOH. I just checked. It isn't twist and push. It is just push. If the piston went in hard, I'd be definitely changing it. Whenever doing pads, I open the bleeder screw to get out the crud at the bottom before pushing it in. Piston still looks cockeyed so maybe a pair of calipers isn't a bad idea. You should probably do a fluid flush anyways. It was in there crooked, not straight. Sorry I got censored. 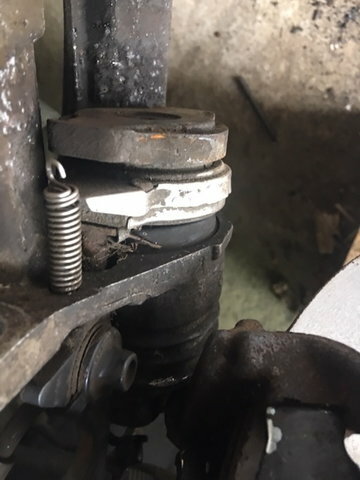 I tried to push on the brake pedal forcing it out then using my friends brake comressing tool to push it in, but I can't get it to go in enough to get it over the new pads. A replacement caliper. It is the original caliper. Is there a place that repairs the one you send in? I'm going to say that it is FUBAR based on what you said. If it isn't necessary for you to get the original caliper, I would think you are better getting a pair of replacement calipers. If it has pushed a notch into the bore, NFW would I want it back unless I would drive it up and down the driveway only. I got out my 95 (same as 93) FSM and took a look. I have a suggestion from my reading: Make SURE the park brake is fully released, AND that the cables are slack. If the cables have been adjusted for some reason, after replacing the first side's pads, the park brake may be slightly applied, not allowing the new pads on the second side to fit, because the PB mechanism is slightly engaged. Disconnect the PB cable from the offending side, and try again. If the pads now fit, work on the cables. I removed the caliber with the emergency brake attachment to engage the brake removed, but thanks for the suggestion. I ordered a new right side rear caliper from Oriely's. Everyone wants a core, so ordering one on line is impracticable. I broke a allan wrench trying to get the bracket off that supports the emergency brake cable. I got it soaking w WD40 overnight. Going to get me one on a socket drive, rather then the L.
If all goes well, I need to do the other side, rear next.